Ignatz Wittmann founded the dairy in Zvolen, Slovakia. Vagac, Molec, and Wittmann families are mostly credited with pioneering work in manufacture of bryndza. W.W.I – the dairy was managed by the Central Supply Agency, (Austria-Hungary) which also directed manufacture and sale of bryndza. Because of the difficulties with this type of management, Molec, Vagac, Wittmann and an influential Hungarian Dairy concern, united and established a share holding company, Hornouhorske Bryndziarne, in Zvolen. The joint holding company split and the members began dairy manufacturing under their own names. 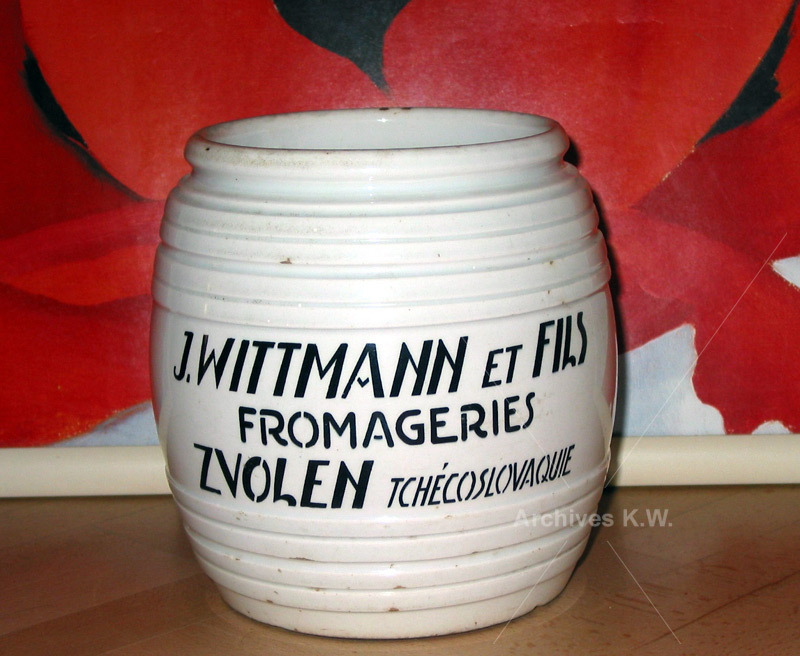 Founding of the company and the brand name I. Wittmann & Son. (Ignatz Wittmann and his son Vojtech). Vojtech Wittmann, was trained and educated in dairy sciences, fluent in German, Hungarian, Czech, Slovak and could communicate in English and French after his immigration to Canada. The dairy and cheese manufacturing program was enhanced with production of processed cheese and introduction of the trade mark Janosik which persists to this day. 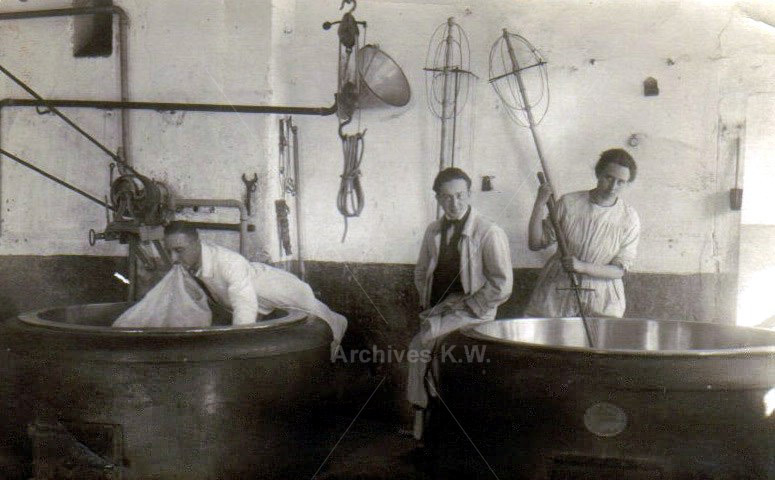 I. Wittmann & Son introduced modern pasteurization and established a dairy laboratory developing its own cultures. 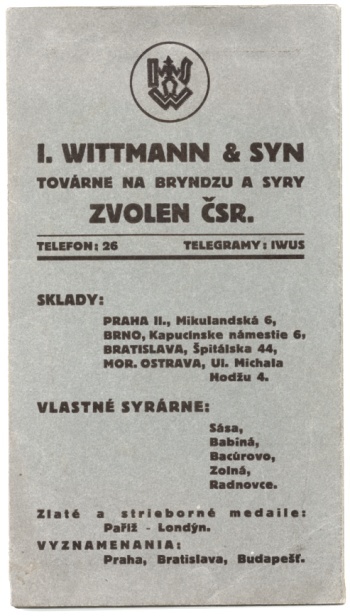 I. Wittmann & Son was the largest dairy and cheese manufacturing concern of its type in Czechoslovakia. It was the only dairy company in Slovakia manufacturing the four basic dairy products. Consumer and fermented milk and cream products, white yogurt or with added fruit, sheep’s milk cheeses such as Bryndza and Roquefort which was renamed Zvolen Blue Cheese, various hard cheeses including Emmenthal, Gouda, Edam and the smoked sheep’s cheese Ostiepok, soft ripened cheese Enzian, Bella Viera and processed cheese, Janosik, Anca, Baca. The Zvolen company had satellite cheese manufacturing sites in towns of Sasa, Babina, Bacurov, Zolna and Radnovce. Warehouses were maintained in Prague, Bratislava, Brno and Moravská Ostrava. The company gained gold and silver medals in Paris and London and honorable mention in Prague, Bratislava and Budapest. 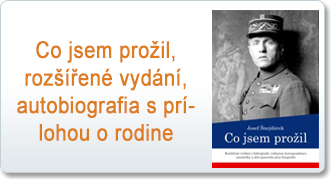 As per the war time government decree 198/1941 of the Slovak State (Aryanization) and following the directive of the Central Economic Agency in Bratislava, the company was conveyed to Teofil Alexander Babala, and later to Buchta. The name Babala and Buchta were erased from the records and the company was conveyed to a union of dairy cooperatives. The construction of the new I. Wittmann & Son dairy and cheese manufacturing plant in Zvolen. I. Wittmann & Son and numerous other Wittmann properties and possessions are being confiscated by the Communist regime. The Wittmann family flees to Casablanca taking refuge with Joseph Schneidarek, Marie Wittmann’s brother and the son of legendary General J. Schneidarek who died in Casablanca in 1945. Unable to leave Czechoslovakia together legally, Marie Wittmann with her son Peter and daughter Katharine were miraculously given a travel permit (to settle the affairs of her deceased father). Vojtech Wittmann’s departure three months later was a classic cross border escape on a bicycle and foot to Austria. After 18 months in Africa (Casablanca) the family immigrated to Canada. 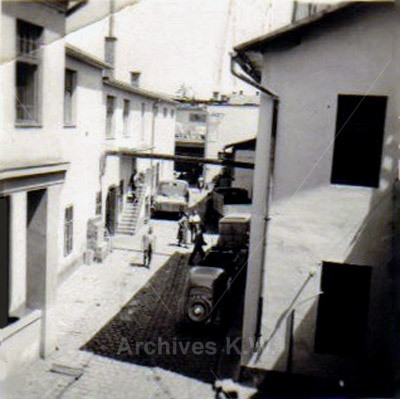 The former I. Wittmann & Son dairies were integrated into the national industry program under various names of nationalized companies, the latest being Zvolenska Mliekaren a.s. I. Wittmann & Son Ltd.
Katharine Wittmann established a new company, I. Wittmann & Son Ltd. She renewed the family trademark I.W.S with the clear intent to restitute the confiscated properties and continue with rebuilding and expansion. She was able to lease the dairy’s processing equipment and work force until the finalization of the lengthy restitution proceedings ensuring uninterrupted continuation of the company. The lengthy and difficult legal proceedings in the restitution process are brought to a successful ending. 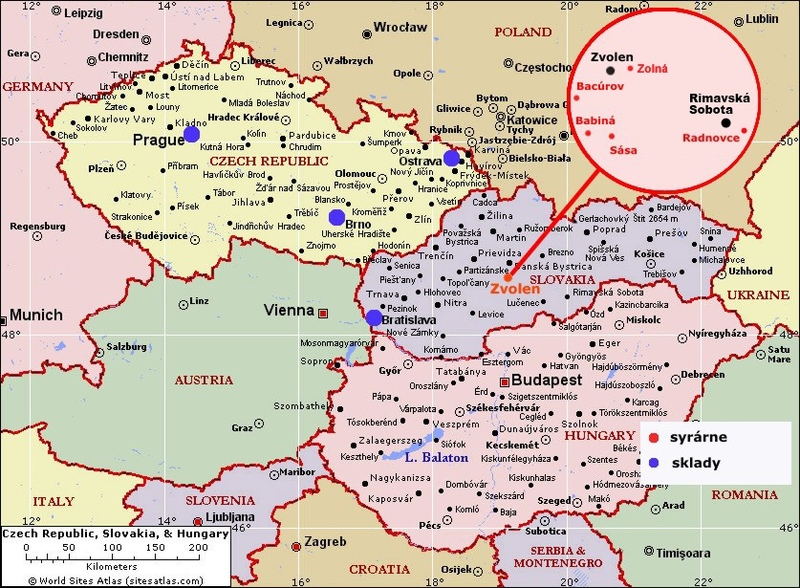 The identified Wittmann properties were returned, however as per current legislation, only to those individuals who could and have legally applied for restitution and had permanent residence in Slovakia. I. Wittmann & Son continued in dairy production by leasing the processing equipment from the state as only the original buildings and land were returned through restitution. The manufacturing equipment belonged to the state. Consumer milk, fermented dairy products, hard cheese, processed cheese and yogurt were manufactured. Its Zvolensky Ostiepok, (a type of smoked cheese) gained a prize in Germany. 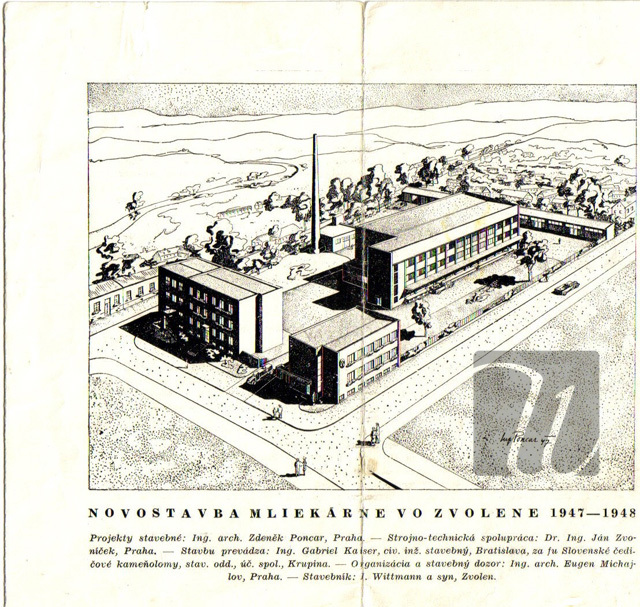 Privatization of Zvolenska Mliekaren was completed and production continues under its original name of I. Wittmann & Son. The company is sold to Bongrain Europe S.A.S. The 70 year old Trademark “Jánošík” is sold to Bongrain Europe. more pictures from I.W&S dairy history in gallery.